This is one of the my childhood snack in Kuching, Sarawak. Even until today, it is still very common in Kuching.. A pack of these 10 small cakes will cost about RM2. 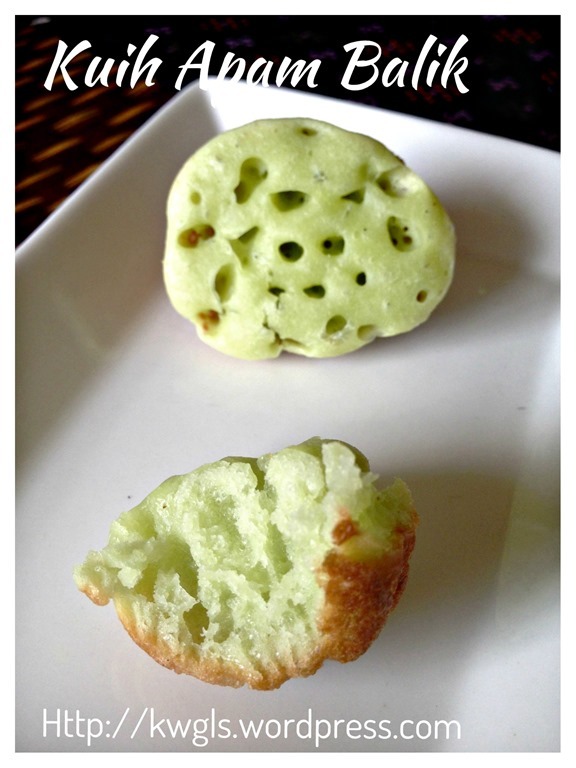 It is spongy and full of pandan and coconut fragrance. 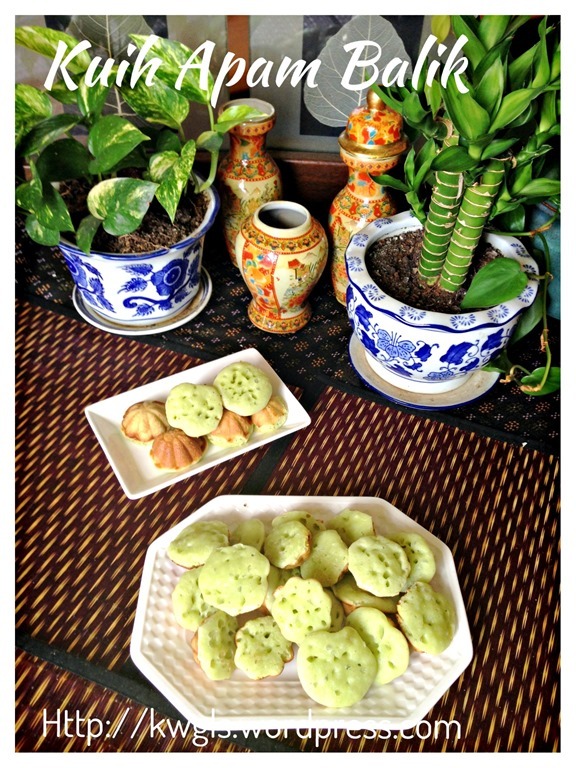 However, I am unable to find a consistent name for these small cute green kuih. 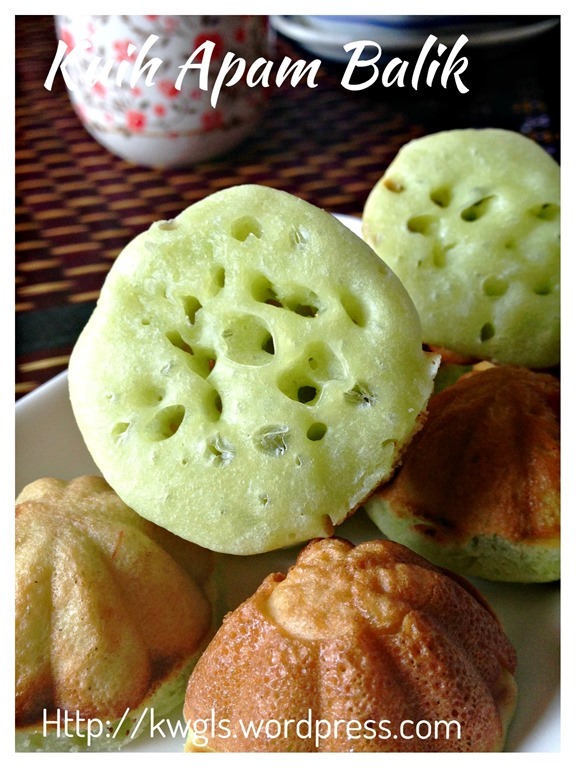 In Kuching, it was called kuih manggis possibly the shape looked like the flesh of a mangosteen. In my original recipe, it was called traditional Bahulu. 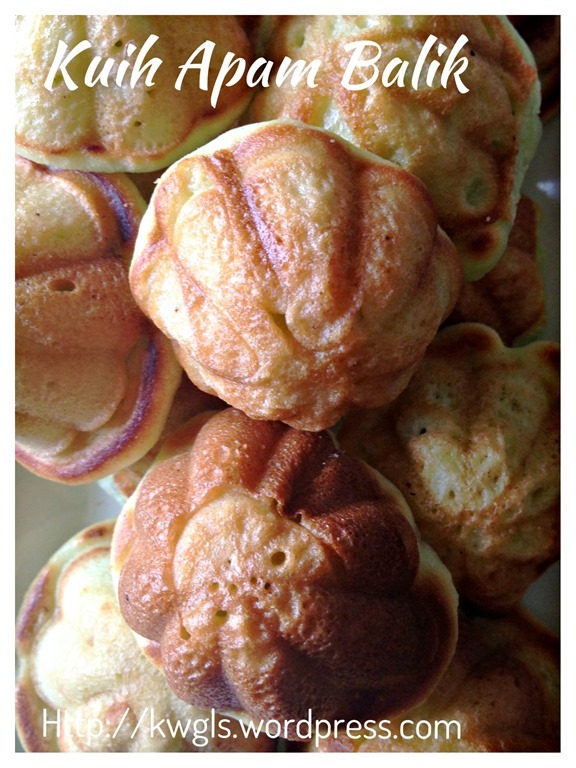 My friend who have the recipe told me it is called apam balik. 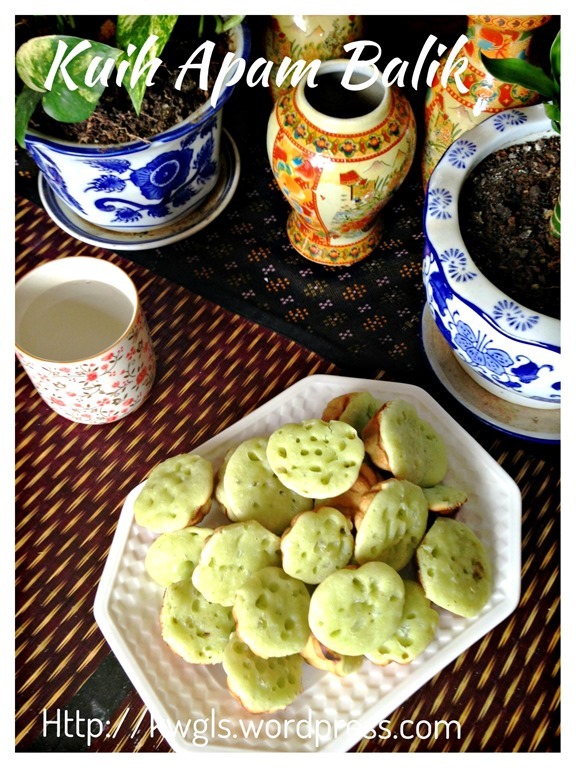 Subsequently, some said that it is kuih syara and a few bloggers have used this name for the kuih. 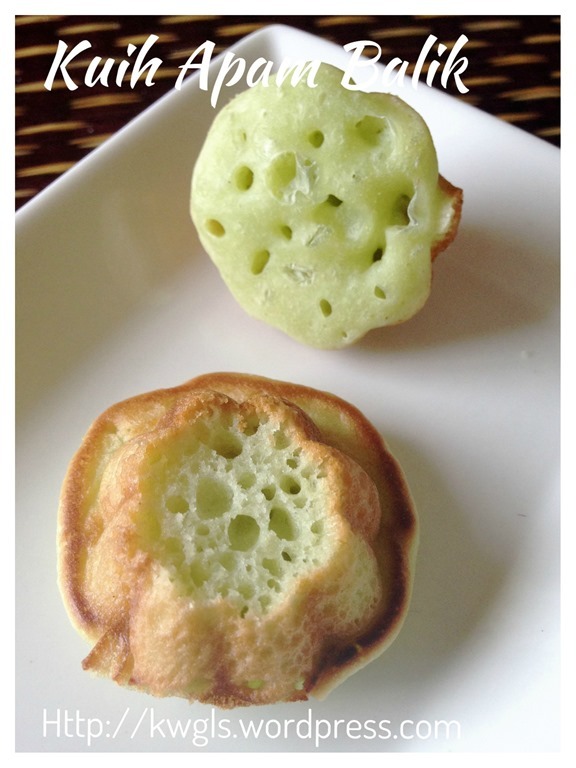 Some West Malaysians and Singaporeans believed it s called Kuih Cara or chara though I have told them that this is slightly different since kuih cara bakar have no airy holes in the cake but this cake have lots of airy holes, making it very spongy to bite. 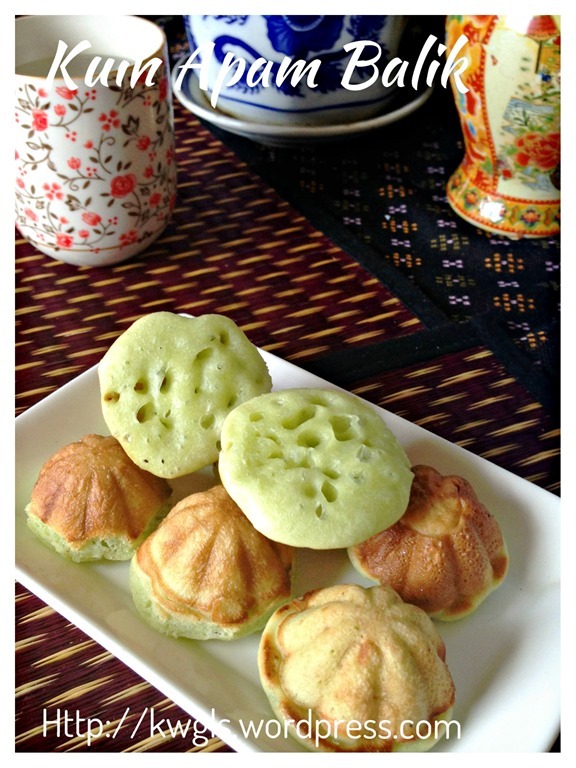 Having said that, I believed that there is possibility of this kuih is a variant of kuih cara but leavened by baking powder or traditionally, natural fermentation. As mentioned above, this is a spongy cake. It taste like coconut jam (kaya) in solid form. I have prepared it using the brass bahulu mould over the stove. However, I am unsure if it can be baked in the oven. If I am going to experiment, I will preheat the oven with the mould at 200 degree Celsius, fill the mould and baked at 180 degree Celsius. 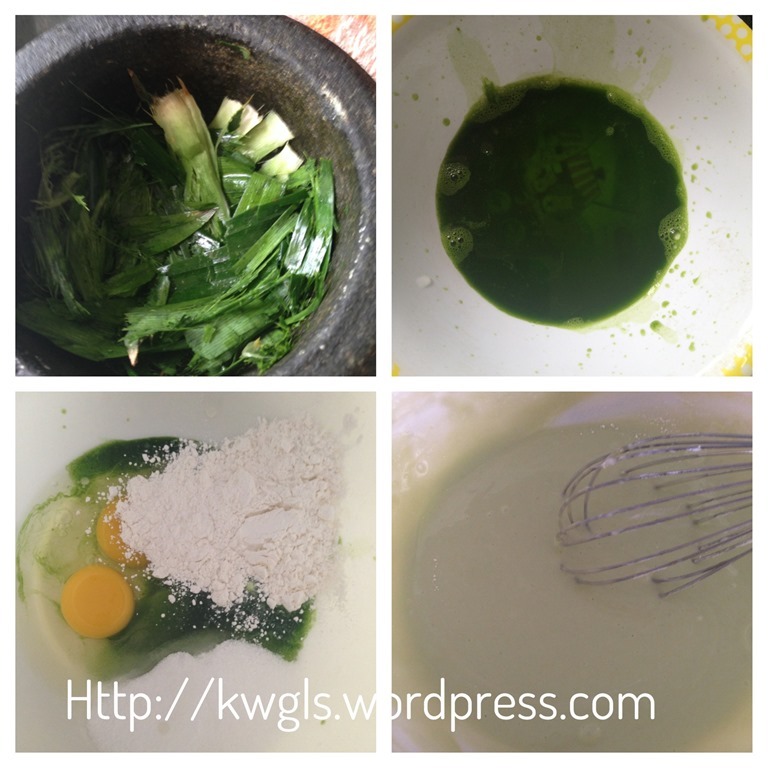 Pound the fresh Pandan leaves and extract juices. If it is too dry, add 1-2 tablespoons of water. 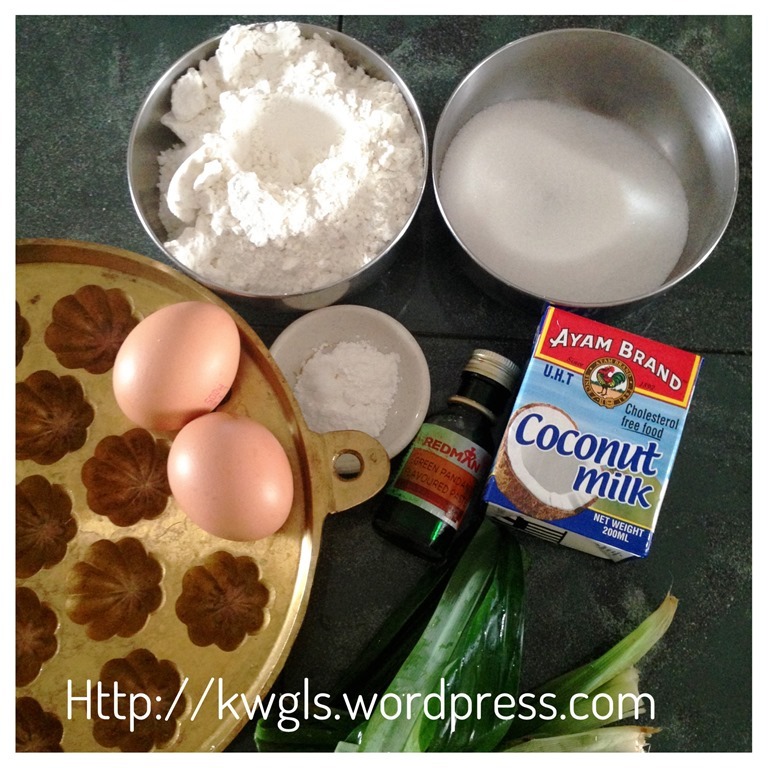 In a big bowl, crack eggs, put pandan juice, double acting baking powder, sugar and cake flour. Use a whisk to whisk until well combined, sugar have dissolved and free of lumps. 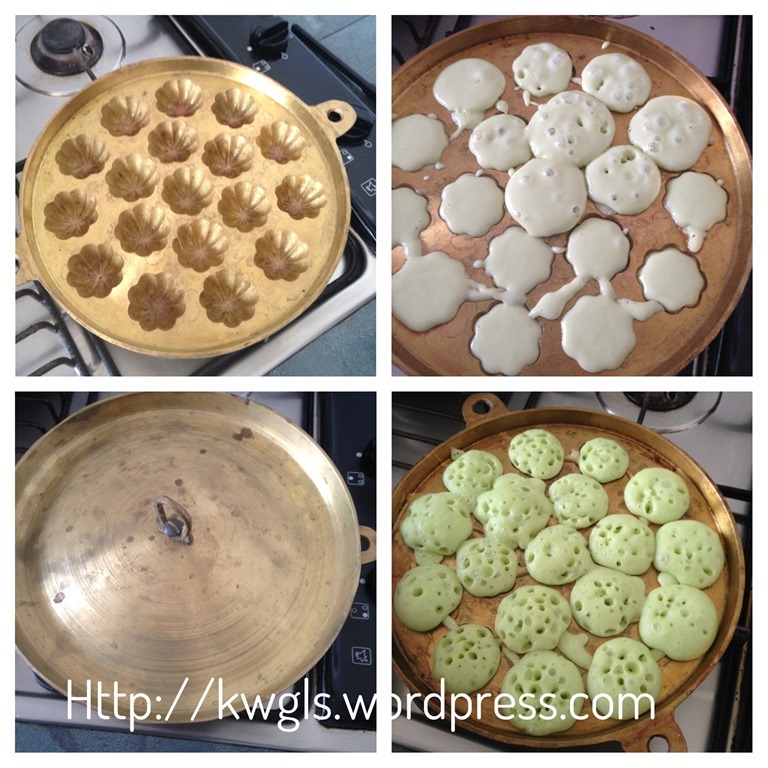 Grease the kuih bahulu mould using cooking oil. Heat the mould over the stove under medium heat for about 2-3 minutes. Spoon the batter into the mould and cooked for until holes appear on the surface. Cover the the kuih and cook until the surface of the kuih dries and well cooked. Use a skewer to take out the kuih. It should be noted that ONLY LOW TO MEDIUM HEAT shall be used. You have to be patience and it took about 15 minutes to finish one batch. Traditionally, it is my honest believed that natural fermentation using coconut water were used to prepare kuih. However, in recent years, baking powder were used to expedite the process of preparation. 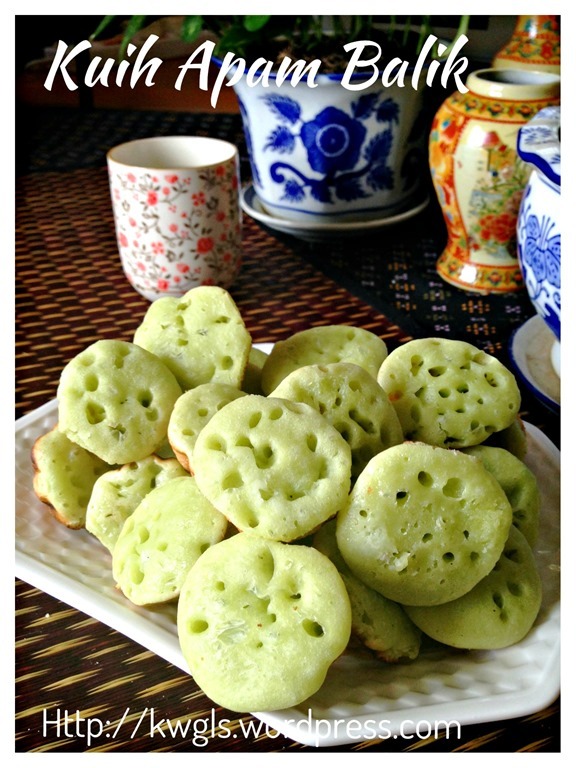 The kuih shall be spongy and full of holes. 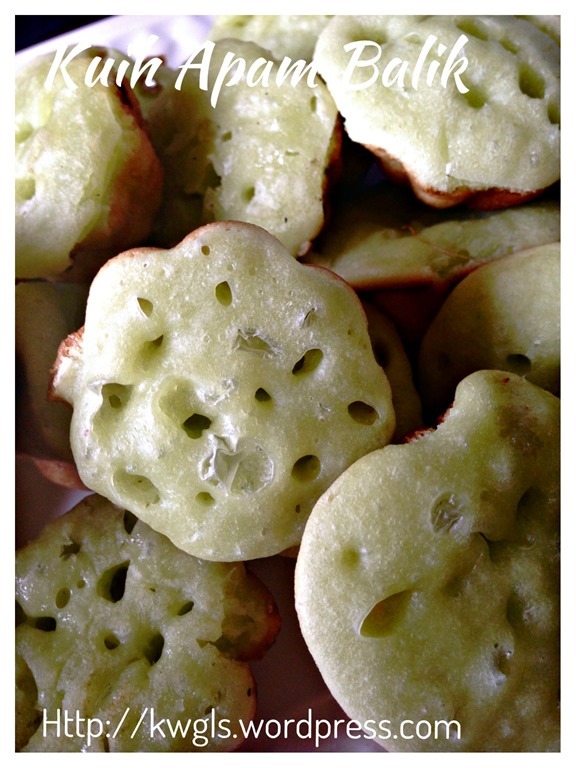 If there is not holes, the kuih will be mushy. Whatever name it is, I hope that you can give it a try. 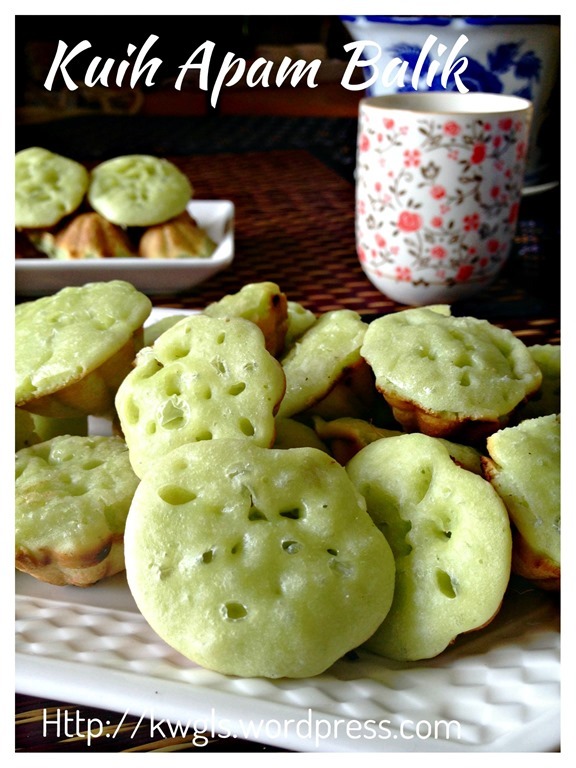 I have decided to issue this niche recipe for the sake of Sarawakian cuisines and curb my cravings of this kuih. 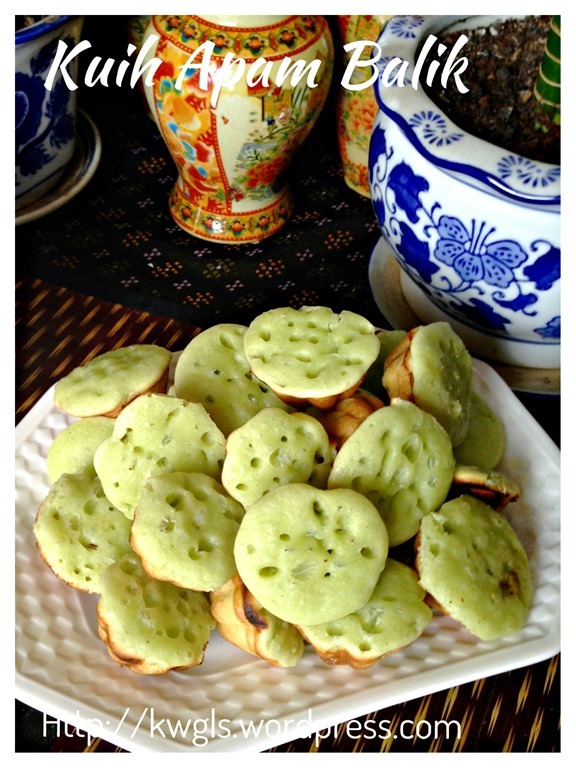 This entry was posted in Chinese and Asian Cakes and Snacks, Food Preparation Series and tagged 8, 香兰小青糕, GUAI SHU SHU, Guaishushu, kenneth goh, kuih cara, kuih chara bakar, kuih manggis, kuih syara, postaday. Bookmark the permalink. 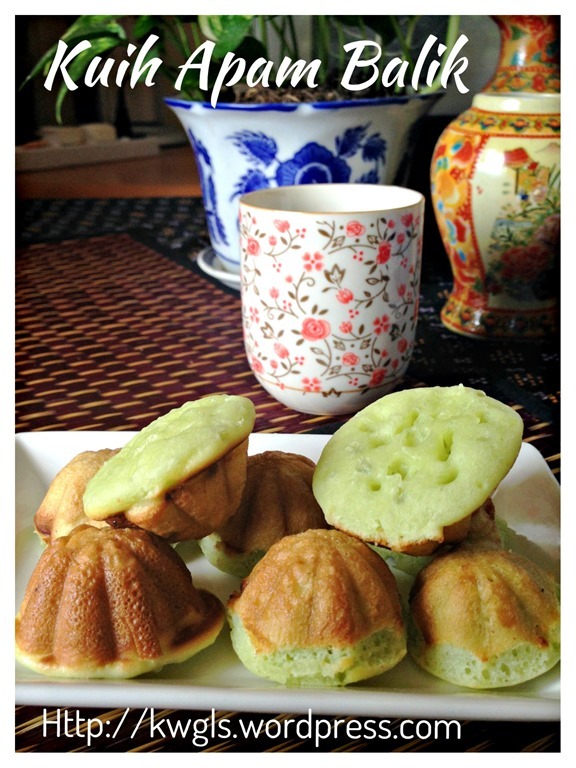 May I know where I can find a lid for the kuih bahulu? Thanks!